"We had a great time. Our horses also enjoyed their stay!" Just passing through with horses in tow? Take advantage of our special bed & breakfast rate, which includes one night's lodging and breakfast. Spend the night in one of the Farm's cozy, quiet cabins and wake up the next morning rested and ready for the next stage of your journey. And don't worry about your horse: overnight stabling for horses is available in the Farm's remodeled cow barn or in several outdoor stalls. See our rates page for horse lodging prices. 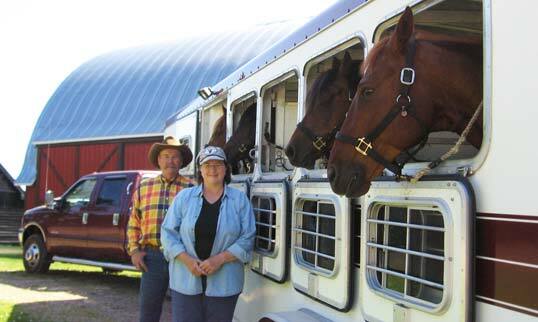 Horse Bed & Breakfast rates do not include the use of The Farm's trails or other activities. For a more comprehensive horse vacation package, see our regular Horse Vacation section, and visit our rates page for current prices.